A Scrofa Hunting TRip to Hungary a few years ago. We take a look at some of the symptoms of wild boar fever! Whatever type of hunting you enjoy, it is often what happens before you take the shot that builds the excitement. Squeezing the trigger is a mere instant in what can be a long chain of events. Naturally the hopeful conclusion of a hunt is to take a successful and memorable shot, but it is the anticipation and participation in a hunt that derives the most enjoyable experience. Whether waiting on the foreshore for a flight, sitting in a pigeon hide, rough shooting with your dog or out stalking, you never know what’s going to happen next and that is part of the thrill. Different times of the year, different weather conditions, morning or evening, all add to the mix, but the biggest unknown factor is usually the quarry being hunted. Each hunter has their own background, experiences and ambitions, but for many rifle hunters the pinnacle surely has to be hunting driven wild boar. 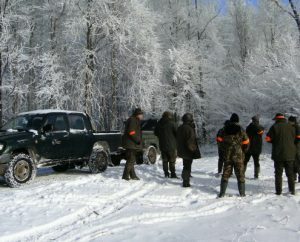 In the past this type of hunting was quite restricted and most UK hunters could only ever dream of taking part in a high quality driven hunt in Europe, but changes in the past 30 years or so have made travel to and participation in driven hunts to countries such as Hungary and Germany far easier. Each country has its own traditions and practices and so will do things slightly differently, but the basic format of a driven hunt remains much the same. Hunters are usually placed on their posts in advance of the beaters and dogs driving the game towards them. Once the hunter has been placed by his guide, he is usually left on his own and it doesn’t take long for the forest to settle down. At this stage in the proceedings the forest can be totally silent and apparently devoid of wildlife, but experience teaches us to expect the unexpected at any moment. The quarry being hunted may turn up at anytime, maybe even before the drive has started properly, or maybe not at all…. The hunter must keep his wits about him for the complete duration of the drive, otherwise the only potential opportunity may be squandered. Sitting there patiently, quietly, not moving, just taking in your surroundings, looking and listening, and then a bark, a faint noise in the distance, but definitely a bark. A dog is on a scent, maybe a deer, but hopefully a boar. The heart starts to beat a little faster and all senses go on red alert. This is the first symptom of wild boar fever. And it probably won’t be the last. Once the drive is in full swing, there is more chance that an animal might come your way, but that is not to say that an animal can’t appear at any stage of the drive and from any direction, regardless of the location and direction of the beating line. As the beaters approach and the dogs pursue their intended quarry, the noise level within the forest increases and it becomes virtually impossible not to get excited. The slightest movement, a small bird flicking from branch to branch or a leaf falling carelessly down to the ground, has the hunter twitching and ready to spring into action at a moment’s notice. The heart beat grows stronger and louder and no boar has been seen yet and then, a loud crack as a branch is broken or the rumbling sound of animals moving over frozen ground, and the black beasts are there bursting out of cover and approaching at speed. Although not moving outwardly, the hunter’s chest is close to exploding as he controls himself in preparation for taking the shot. This is the moment that the hunter has been waiting for, but he needs to control his wild boar fever and remain calm. There is usually a great deal of waiting on a driven boar hunt prior to any action and when it comes it is normally over in a matter of seconds. The adrenalin may be pumping, but control is required in order to make the most of any opportunity that presents itself. The hunter must not move until the right time and then he needs to be quick and decisive. Quick to select the correct animal to shoot and then, hopefully having despatched the first animal, move on to a second suitable animal if it is presented. When the action is over and if it hasn’t happened already, the hunter will be fully gripped by wild boar fever and completely enveloped in what has just happened. The fever may subside after a while, but it will return time and time again as the action within the forest ebbs and flows. Whether the shot was successful or otherwise, the all encompassing feeling when possessed with wild boar fever is hard to explain, but once experienced it leaves a craving for more. Returning home and going back to ‘day to day’ stuff helps relieve the symptoms to a degree, but the fever lurks within and will resurface well before the autumn, drawing all addicted boar hunters back to their favourite hunting territories once again.